An electronic cigarette is nothing but the mixture of water, e-liquid, flavors along with certain proportion of nicotine and stabilizers. I would say that you can make your e-juice effortlessly in order to save your money as well as to have your own distinct taste. Here is the introductory guide for you to prepare your own Do-It-Yourself (DIY). E-Liquid Base: You can use propylene glycol, vegetable glycerin or PG400 as your e-liquid base. The base you use need to have food grade. You must remember that the base is the component that is going to make the noticeable amount of smoke or fog on your electronic cigarette. In simple terms, this is the component that would create the smoke. Distilled Water: You can make use of purified potable water for the purpose of preparing ejuice. You must remember that the other types of water like tap water would contain a lot of elements, thereby, making it unhealthy for the lung vaporization. Flavorings: You must require a food grade flavor for this purpose. At the same time, the flavor should be water soluble and resistant to elevated temperatures. This is because, the other flavorings which have room temperature resistance would not be ideal for smoking with an individual vaporizer. Stabilizers: Not obligatory stabilizers like nicotine and herbs can be used. In addition, you can also use the stabilizers that are used in tobacco and herbal recipes. Following are some of the procedures that are involved in preparing your ejuice. Place approximately 10 to 20% of the flavor strength in the e-liquid base which would depend upon the type of base and strength of your nicotine. This would also depend upon the strength of your own flavoring. The next procedure will be to utilize empty bottles along with syringes. By following this procedure, you can be able to create your distinct e-liquid according to your own preferences. In addition, you can also regulate the configuration without much effort. If you want to have a thicker smoke, you must reduce the amount of water used. If you are creating the mixture that contains stabilizers, you can leave out the water. Instead, you can use a few drops of stabilizer mixture depending upon the concentration as well as flavor. While preparing your own juice, you will have the chance of altering your taste intensities by using the e-liquid bases and the nicotine strengths. You will have to re-adjust the flavor intensity by using various e-liquid bases along as well as the distinctive concentrations of nicotine. Typically, you will have to put 6 to 8% of flavoring strength in your e-liquid. 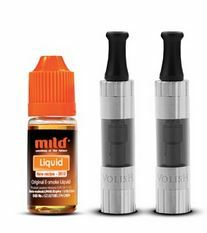 Thus, you can be able to come up with your own distinct e-liquid for your e-cigarette without any difficulties. This Do-It-Yourself guide will provide you an easy way to prepare the e-liquid with varying range of tastes and flavors. Just remember that this is general information – it cannot be used for yourself, also you should not use it, if you do not have advanced knowledge about preparing chemical components.